Where is Low Quality flag? 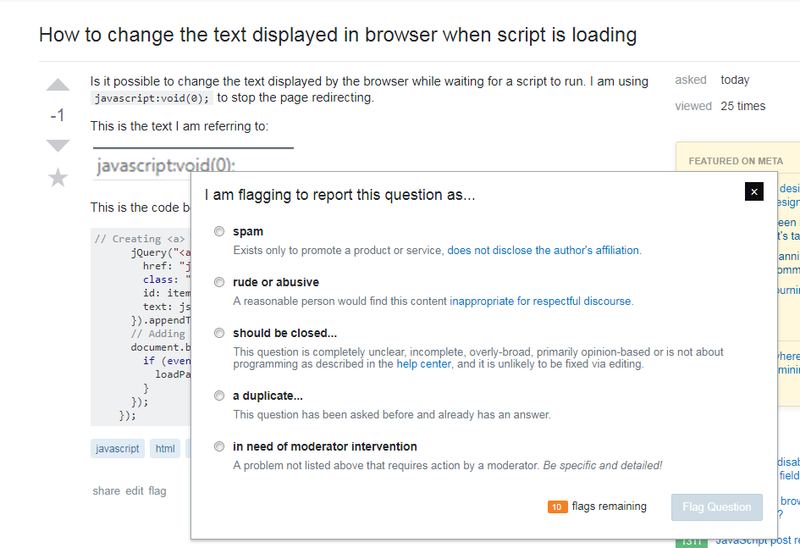 Is this will be fixed (added ability to use Low Quality flag) or this flag is forbidden forever and page on help center just hasn't been updated properly? I have thoroughly read this answer, but it cannot help with my question. OP in that post refers to question that is too old and VLQ(Very Low Quality) flag doesn't appear among of other flags. The low quality flag option will come up for zero or negatively scored posts - that's the first indication that a post is indeed low quality (or suffers from other issues). the VLQ flag is no longer available on posts older than 7 days (the precise value may change, but 7 seems reasonable). If there are some limitation with VLQ flag appearing, it would be good to add them to help page center. Speaking of your examples with recent non-positive score questions, one where the flag is not available is apparently under review (per the first item in the above list). 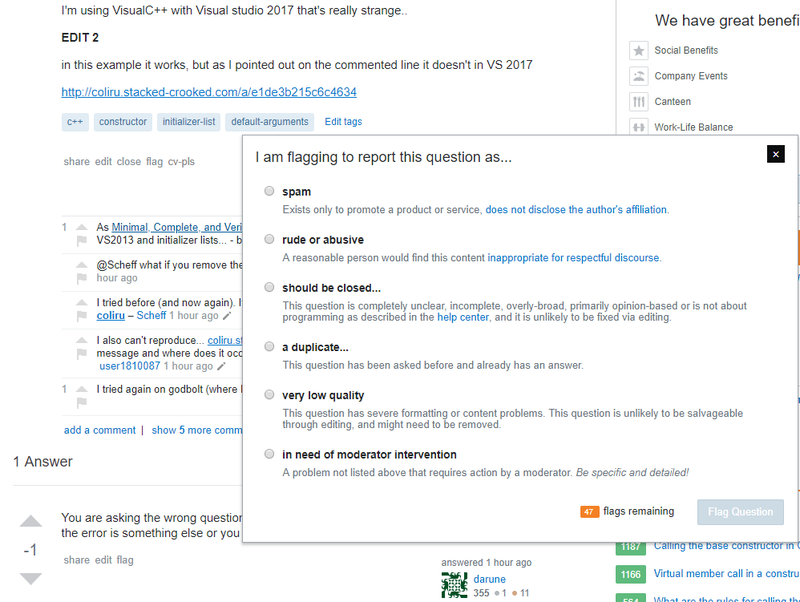 If you flag or vote to close another question and wait for several minutes until it gets into the review queue, you will notice that the VLQ flag option will become unavailable for that post as well. An interesting effect is, since the system automatically pushes some questions into the Triage queue immediately after posting, you can find cases where the VLQ flag isn't shown from the very start. 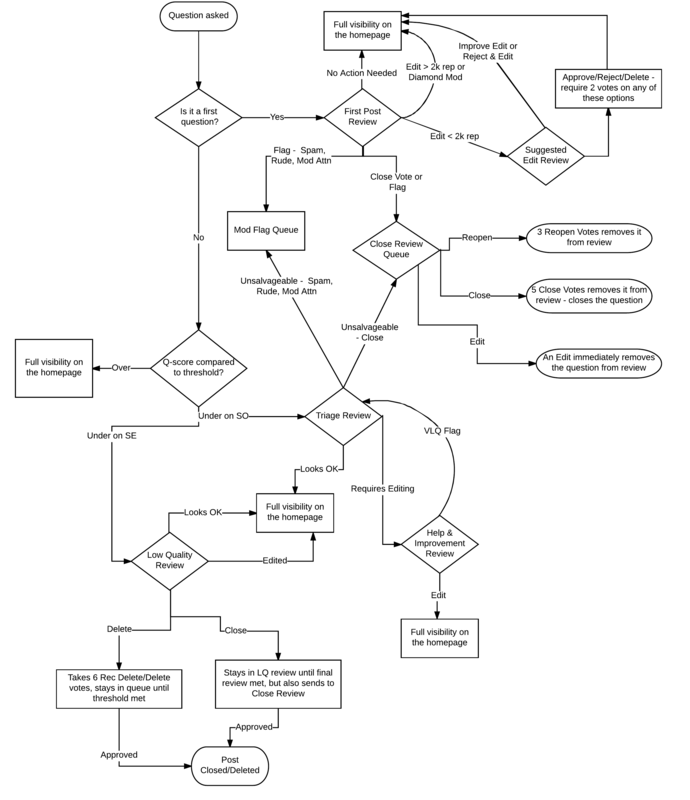 I frequently observe this in my favorite cleanup-search for recent low score questions. see also Flag Options Missing - Is this a bug? Well there's clearly some doubt about what causes this flag option to hide. Now the post doesn't need to be closed. So as of a few minutes ago, Very Low Quality won't be an option from within Triage review or from anywhere else while a question is being triaged. We're also taking this opportunity to be a bit proactive with another change that'll be necessary soon: Very Low Quality won't be available for questions that are currently undergoing Close review either. Also see here Why is the "very low quality" flag unavailable here? 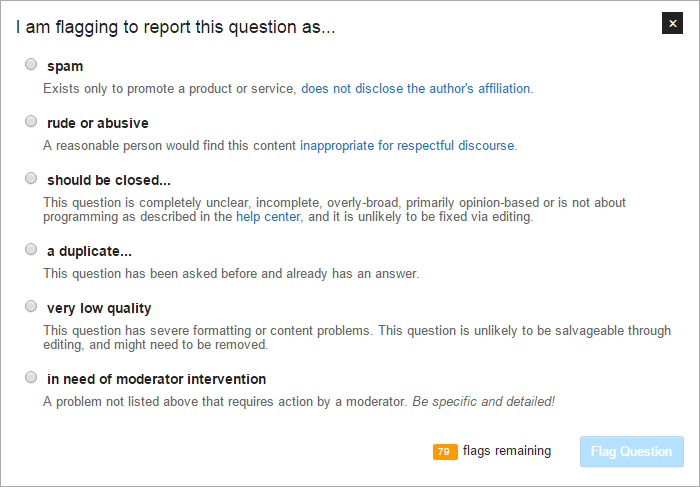 Note: this doesn't explain why a question with a close vote will still show the low quality flag dialog. As a close vote will automatically put a post into the close vote review queue. There is a delay between close voting and the post being in the review queue. A "job" runs every five minutes on the main site to put posts into the review queues. Courtesy Mayken. Also worth noting the flag options change once a post is closed. Not the answer you're looking for? 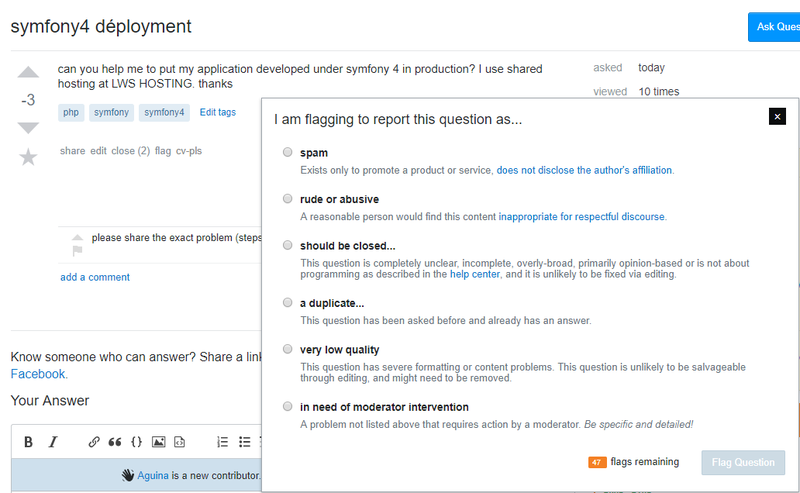 Browse other questions tagged bug status-bydesign flags user-interface flag-dialog . Why is the “very low quality” flag unavailable here? What is it I don't understand about the “very low quality” flag?